If you are anything like me… you find yourself out-and-about wishing you had brought a second notebook with you. I love to sketch and draw – even for non-artistic purposes. For example, I see something I would really love to create a DIY project for. If I have my hPDA with me, I at least have something to jot down some quick notes. But what happens when I want to record the visual aspects or start drawing up plans? This ‘hack’ will hopefully solve that problem. The only difference in construction from making a standard Circa/Rolla notebook is extending the back cover to accommodate the top discs for the “second” part. I simply added just under a quarter of an inch to the top of the back cover. Smurfing (or Circa/Rolla punching) was quite simple. 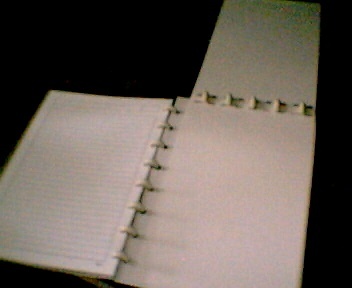 I took one piece of my pre-punched paper and aligned it so the cover extend just a smidge past the bottom of the sheet. Then I punched the left side. 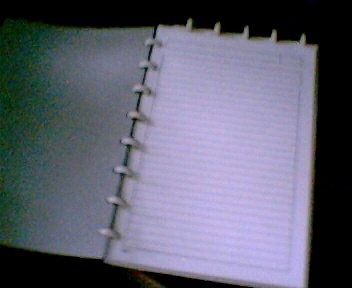 Since I am addicted to “Junior” sized notebooks (5.5 by 8.5 inches), I cut my sketch paper to a width of just 5 inches. This allows plenty of room to clear the side discs. I cut my cover to just over the standard “Junior” size. I like my covers to protect the inside pages. I may have to cut a bit more off of the top to ensure the top discs do not interfere with the closing. But this is just a minor adjustment that can be made at the discretion of the user. And there you have it – a DIY Combo Notebook. Currently I am working on something in an hPDA size using this same idea – some cards will be standard index cards and the other ‘notebook’ will be sketch paper. Wow, Sara, this is a remarkable idea! Needed your visuals, too! :) A must-attempt for me! :) Thanks for sharing! Unbelievably good stuff. I just woke up to hPDA, Circa, Rolla, it is all mindblowing but what I need. Will take me awhile to muddle through all of it. But organization is what I long for. Thanks for all these cool ideas. A brilliant piece of work here. A shinning example of what can be done with Circa–by a creative person. Bravo!